Reflective model according to Rolfe et al. 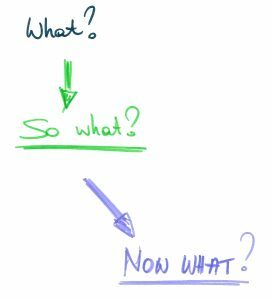 This reflective model is probably amongst the simplest ones, as it is based on three questions only. However, this does not mean that the reflections should remain superficial, but should be as comprehensive as possible. The first stage is a mere description of what happened and of the experience you would like to analyse and take forward for your own learning. Once the description has been completed carefully you should ask yourself what the experience and situation means. To this end you will need to consult literature and colleagues if you are to get a comprehensive insight into the matter, as otherwise you will rely on your own interpretations only. At this last stage of Rolfe et al.’s model you are asked to consider the steps you will be taking in order to improve your practice and learn from the initial experience. You ought to complete a simple action plan with key pointers about what you will do and how you will decide that your practice has improved.